The United States are preparing to organize the « Greater Middle East » without their troops. They will probably capitalize on the errors committed over the last five years by Iran in order to create a Judeo-Sunni military alliance, dubbed the « Arab NATO » by the Press, who will be sent to fight the Shiites. 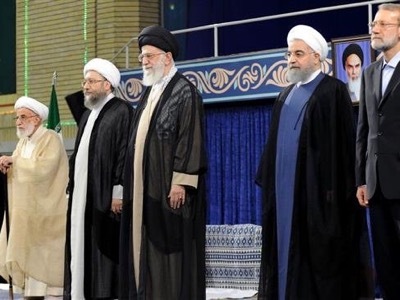 From left to right : Ayatollah Ahmad Jannati (President of the Assembly of Experts, the 86 religious sages who preside over Iran) ; Ayatollah Sadeq Larijani (Chief of the Islamic Judiciary) ; Ayatollah Ali Khamenei (Supreme Leader of Iran) ; Cheikh Hassan Rohani (President of the Islamic Republic) ; Ali Larijani (brother of the Chief of the Islamic Judiciary and President of the National Assembly). Contrary to a popular idea, the neoconservatives are not the enemies of Iran, and not the friends either. They have always considered that it was necessary to maintain a balance between Arabs and Persians. This was why Elliott Abrams participated in the « Iran-Contras operation », which notably consisted of selling Israëli weapons via Cheik Hassan Rohani (currently the Iranian President) to Ayatollah Hachemi Rafsandjani (who consequently became the richest man in his country) in order to resist the Iraqi attack (which was also commanded by Washington). This operation was carried out without the knowledge of Congress, then condemned, and later amnestied by President Bush Sr. The Trotskyites from the magazine of the American Jewish Committee, Commentary, who rallied, like him, to Reagan, intended both to combat the USSR in order to pursue Leon Trotsky’s struggle against Joseph Stalin, and at the same time to realise a world-wide coup d’état, if this idea even has any meaning. Elliott Abrams thus participated in the creation of the US Institute of Peace (which used the humanitarian platform to promote imperialism) and the National Endowment for Democracy (which orchestrated the colour revolutions) of which he is still one of the directors. This is how we should understand theopolitics, as a religious justification of a world-wide power grab. The founding Congress of theopolitics was financed by the Izmaïlovskaya, a Russian criminal organisation of which, according to the Spanish Judiciary, Michael Cherney, Oleg Deripaska and Iskander Makhmudov were members at the time . Secondly, even though they stand together against foreigners, the governors of Iran are extremely divided between the Supreme Leader (Ayatollah Ali Khameney), the President of the Republic (Cheikh Hassan Rohani), and the chief of the opposition (ex-President Mahmoud Ahmadinejad, who has been under house arrest for a year, and whose main collaborators were imprisoned after a series of secret trials . At the end of Ahmadinejad’s second mandate, President Barack Obama attended secret negotiations in Oman with the Rafsandjani-Rohani team. The principle for the nuclear agreement was then approved. Ayatollah Khamenei side-lined the candidature of Ahmadinejad for the Presidential election by using Ayatollah Ahmad Jannati, and favoured the election of Cheikh Rohani, probably ignoring certain aspects of the agreement he had concluded with Obama. Cheikh Rohani was betting on his secret agreement with the US Democrats. He anticipated the cancellation of US sanctions, and promised a better life for his electors. Once he was elected, he dismantled the system that had enabled Iran to avoid the sanctions, then pretended to negotiate in Switzerland with the major powers the agreement which already been recorded with the USA alone. However, the signature of the 5+1 agreement was not followed by the lifting of sanctions. Since the Iranian economy could no longer avoid them, it collapsed. When Donald Trump entered the White House, he scrapped the agreement with Iran, plunging the Rohani team into panic. Rohani had committed the error of believing that the President would quickly be removed and that the Democrats would shortly be back in power. Iran rejected Donald Trump’s offer of negotiation and is today economically strangled. A Commission from the French Senate is currently working to determine whether the representative for the Elysée, Alexandre Benalla, was or was not being paid by Iskander Makhmudov while he was working alongside President Emmanuel Macron. At this point, only Makhmudov’s payments to Vincent Crasse have been verified. 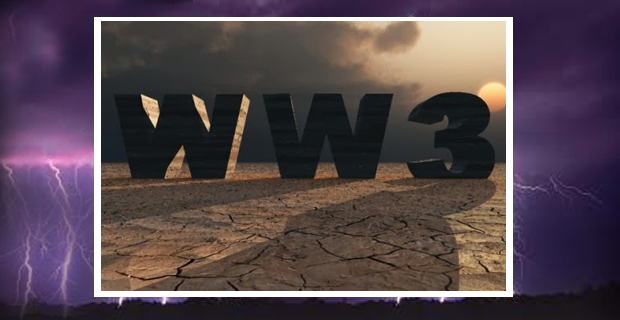 Coming soon : Before Our Very Eyes, Fake Wars and Big Lies, Thierry Meyssan, Progressive Press, 2019. “Israel and Iran collaborate to exploit the Eilat-Ashkelon pipeline”, Translation Anoosha Boralessa, Voltaire Network, 9 January 2018. “Former President Ahmadinejad’s vice president: Sentenced to 15 years in jail following a secret trial”, Translation Anoosha Boralessa, Voltaire Network, 30 March 2018.